Several months ago five people were killed on the Hudson river green way, by a van that intentionally ran them down. We use the green way every week to commute to a project site, it’s a separated lane for bicyclists removed from the traffic and makes a great way to travel. Right after the murders every opening to the road was protected with concrete barricades for the full 10 km to prevent cars from invading into the green way pedestrian/bike lane. They are installed along the lane but the edges are painted with a florescent color to prevent bikers from running into them. 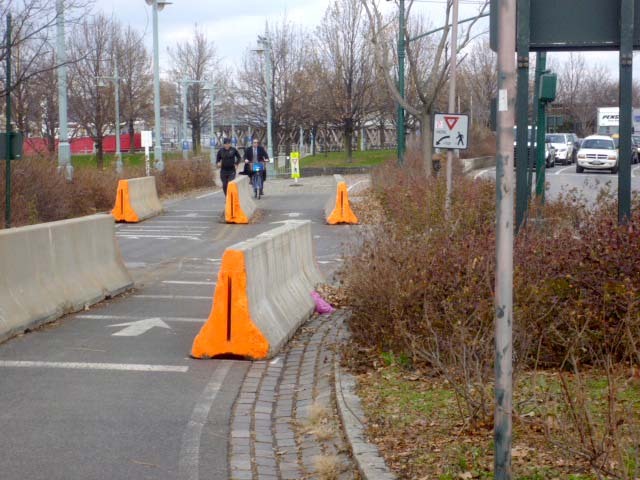 We thought they were ugly because they disturb the smooth flow of bikes and are not appropriate for a “green” way running along the adjacent Hudson River Park. These barricades oddly enough reminded me of the train design of the British railway. The trains are yelling “watch out! I am not going to stop! never” and the barricade is yelling ” watch out, I will never move”. The subjects are different but they share the orange nose and liner form along the direction of movement. Additionally the barricade looks to have something like couplers. This maybe a good example of a theory in Bio-morphology—–a similar function builds a similar form even if they are not related at all. 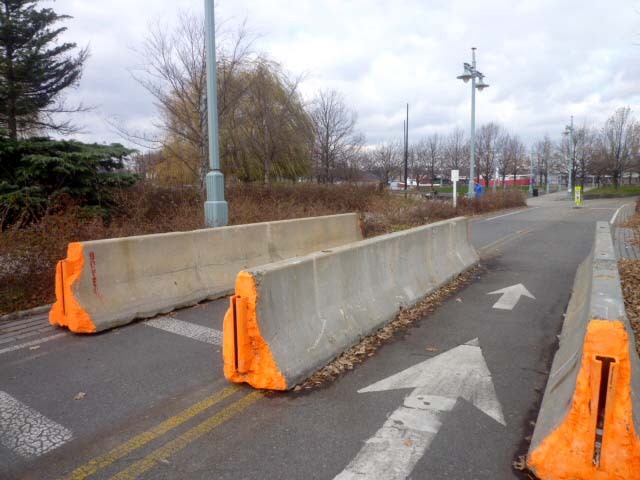 Well, lets come back from this derailing….. what is the advantage of installing this barricade here in reality? This bike lane just happened to be picked. The attack could happen anywhere in New York, any street, any side walk… any place. The city would be packed with these British trains to protect pedestrians and bikes and paralyze the traffic. The city cannot just be silent, they had to do something. Luckily they could do something on this bike lane because of it’s unusual design… there is a bank and a planted border between the motor vehicle lanes and the bike route. Norma almost every sidewalk in New York has direct access to the road to allow drop off to the side walk, access to driveways, fire hydrants, and for deliveries and loading docks, and parking which is the basic assumption of urban design. That is why you never find low plants like in the image below. 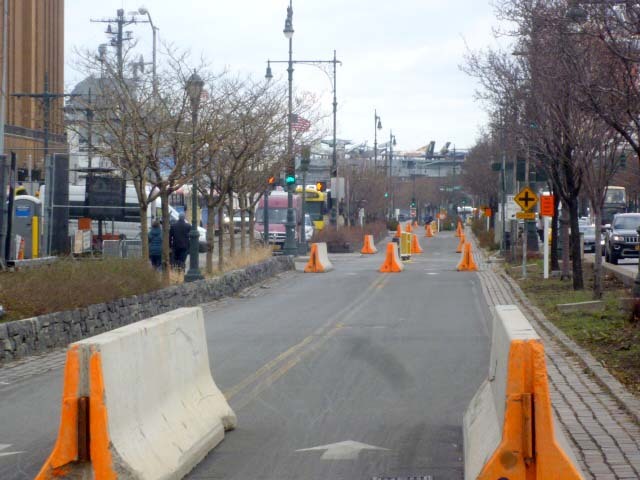 Here the planting and permanent barricades which would never allow cars to go into the bike lane. Installing British trains just at the openings of the lane works very well. Speculatively the main purpose is to tranquilize and ease people’s psychology. After considering I guess that may be the practical function of this British train. A few years ago in Tokyo bombs exploded that were hidden in garbage bins in public spaces. Immediately all of the garbage bins disappeared from public spaces. When the fear that this might happen again faded they all came back. There is no guarantee this will happen again, and I ( irresponsibly) hope these British trains will return home someday when the fear is gone.